Riyadh, Saudi Arabia, January 31, 2017: Over 30,000 camels will gather from the 19th March 2017 till the 15th April 2017 in the city of Riyadh, Saudi Arabia, to participate in King Abdulaziz’s prestigious Mazayen al-ibl heritage festival and camel beauty contest. An ancient tradition, the festival attracts over 2 million attendees from across the globe including royalty, celebrity, designers and athletes. A festival organised and managed by King Abdulaziz Darat, the heritage event and competition is held in respect to the role of camels in Bedouin history, preserving the purebred Arabian camel strains. Safeguarding and raising awareness for the inherited heritage, culture and way of life for the Kingdom of Saudi Arabia and the inhabitants of the desert and the desert-dwelling nomads of Arabia. While the car may have taken over as a form of transport, historically and still today families and tribes across the Arab peninsula have treasured their special and unique relationship with the camel. Camels were a main source of transport, a loyal friend in the desert, a sturdy worker, a cool and shady spot to lean, a reliable supply of milk and, eventually, a supply of food and leather. 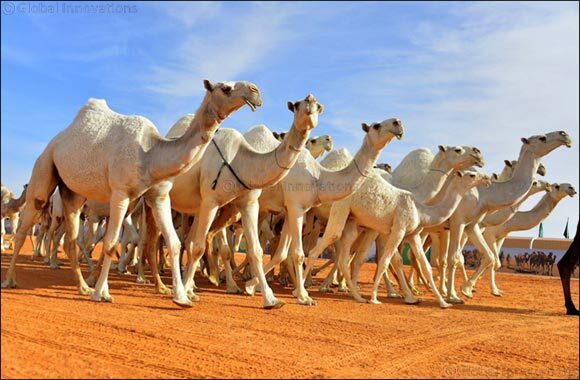 Still recognised today as essential to desert life and also a reflection of social standing and wealth, thousands of proud camel owners from throughout the GCC travel annually with hopes of their camel shining at the camel beauty pageant style Mazayen al-ibl festival. Judged by a committee of selected Bedouin who are considered experts and fully immersed in the ways and culture of Bedouin life and traditions, with winning camels throughout previous years often fetching millions of dirhams in price. Event prizes are awarded throughout the festival with camels assessed in five categories, according to breed and colour. From the Al Wadah white camel to the Al Shual yellow camel, the Al Sefr golden camel, the Al Majahateer dark camel and the Al Homor reddish, brown camel, various features considered most beautiful to each breed are closely assessed to determine the deserving winners. These include; the size of the camels head, whether the lips cover its teeth, the length of its neck, to the roundness of its hump, the size of it’s eyes, how the long lashes are, how the nose droops, whether the ears stand back, how high the hump is and where the hump sits. With registration to participate recently closing on the 14th January 2017 it has been the first year of e-registration for those looking to enter their camels into the competition, making access for entry easier across the GCC and Arab regions. Not only has this resulted in the camel stock market booming, but has led to a growth in interest for the festival, with over 75% of the participants taking part not having entered before. As well as 80% of competitors entering the competition from Saudi’s Riyadh and Eastern provinces, 20% from other Arab regions including UAE, Qatar and Kuwait have entered for 2017. Following strict regulations not all registered camels entered for the competition have been granted acceptance with only purebred camels allowed, and despite owners outside of Saudi Arabia being able to enter the contest, the camel must be kept within Saudi Arabia. Overseen by Saudi Arabia’s Ministry of Environment, Water and Agriculture teams of vets are enlisted to check the health of the camels inserting a microchip into all camels entering the festival to keep track of the camel throughout the competition and to collect invaluable data, surveys and research on camels across the region. Findings showed the most popular camel to enter for 2017 included the Al Maghateer breed a dark yellowish to black camel typical to the Arab regions. To participate camel owners will not only have to show camels with untouched natural beauty but will have to swear the age and ownership for the camel, declaring ownership themselves or within their direct family. As well as parades for the most beautiful camel, Mazayen al-ibl Festival will also include other cultural activities and entertainment such as poetry, folk songs (shalat), feasts and camel auctions throughout the month long festivities. A marriage of cultural, heritage and sports all aspects of the national festival will be highly monitored to guarantee Saudi Arabia’s cultural values are maintained throughout, from entrance of the camel, to conduct of the owner, festive happenings and attendee acceptance. With aim of strengthening traditional practices throughout the Saudi community, this annual national festival looks to connect the new generations to the old as a reflection of Saudi Arabia’s 2030 vision.